Nutritional High International Inc (CSE: EAT) was the darling of the Canadian Securities Exchange yesterday, posting an unbelievable 136% gain on the day. This was done through the exchange of an incredible 32.8 million shares, which caused the company to close at an all time high. This gain was steady throughout the day, followed by a final power hour push that sent it straight up. It’s likely that it gaps up in the morning as well due to this bullish sentiment. As a result of this incredible run, it’s likely that many new investors are currently diving in to the company to see what the buzz is about. To lend a hand to this mission, we established a collection of the four most recent developments on Nutritional High. Our hope is that it provides a solid footing to begin your deep dive into the company. If you are beginning your deep dive into the company, be sure to also check out our November write up on the companies latest dealings here. Within Nutritional High’s most recent news release on December 27, it announced that Calyx Brands had received a key license. This license, a “Medicinal – Distributor Temporary License”, enables the company to be able to legally distribute medical cannabis products in the state of California to medicinal dispensaries. This license goes into effect on January 1, 2017. One item of note, is that it appears the license is valid for a period of 120 days, as per the California Cannabis Portal. It is believed that at this time, only temporary licenses are being issued. More information can be found here. Nutritional high’s December 27, 2017, news release. In addition to this, it was announced that the application for a recreational distribution license had been received by the state. With recreational cannabis becoming legal on January 1, 2017, this will be a key asset to have for the company. Should this license be granted, it will enable them to distribute product to all dispensaries within the state, significantly increasing the potential distribution of Nutritional High’s own branded products. On December 9, Nutritional High announced that its manufacturer of cannabis infused products in Colorado was denied its license renewal. 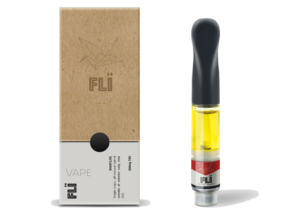 The facility, which is owned by Nutritional High, is the sole manufacturer of FLI branded vape cartridges within Colorado. 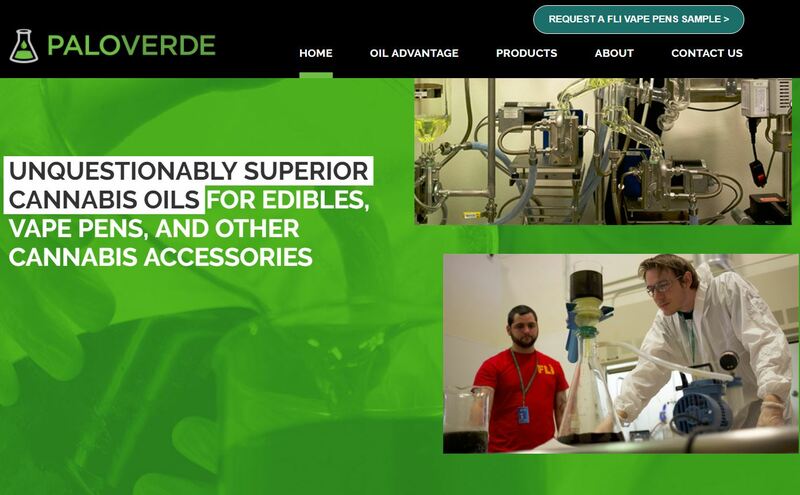 The manufacturer, known as Palo Verde, was denied the license based on the grounds of the suspected undisclosed financial interests of Nutritional High within the company. To this end it is a reasonable conclusion. The website for the company is extremely similar to that of Nutritional High’s. It even uses several of the same images for FLI products. It currently leases its manufacturing facility from EAT, and owes the company large sums of money which was used to establish operations. Further to this, the mention of FLI branded products on its website reference the brand as its own rather than that of Nutritional High’s. It was a reasonable conclusion to come to based on the information provided. manufacturer” license. In additional to this, it had applied for its marijuana cultivation and medical marijuana infused products manufacturer licenses. Both of these were also denied on the same grounds. Palo Verde is currently in operation on the grounds that the denial of the license renewal is being evaluated for proper grounds for denial. Once this final verdict is received the company will know the outcome of its operations. Nutritional High is currently looking for additional manufacturers for its products in the state of Colorado, as well as in other legal states to overcome this potential hurdle. In anticipation of recreational legalization within the Californian market, the company has been hard at work promoting its products and expanding its presence within the state. It previously announced two major developments with regards to acquisitions in the state. Now, Nutritional High has announced that its FLI branded products have become available to consumers in the marketplace as well. FLI branded concentrates. Image courtesy of Nutritional High. On December 20, the company alerted shareholders that its vape cartridges were now available at several dispensaries within the state. Presently, three lines of its products are being produced by an undisclosed manufacturer which are then distributed via Calyx Brands. The company intends to increase its product offerings once it is more established within California, and as production limits allow. With this announcement it marks the second state that the company currently has retail sales in. Prior to this, its products were only available within the state of Colorado. Okay, so this isn’t exactly a “new” development. Long term investors are likely well aware that these warrants exist and when exactly they expire. However, we felt new investors needed to have this brought to their attention. In addition to the 253 million shares outstanding for Nutritional High, there are 37.7 million warrants outstanding as of July 31, 2017 and 16.6 million options. 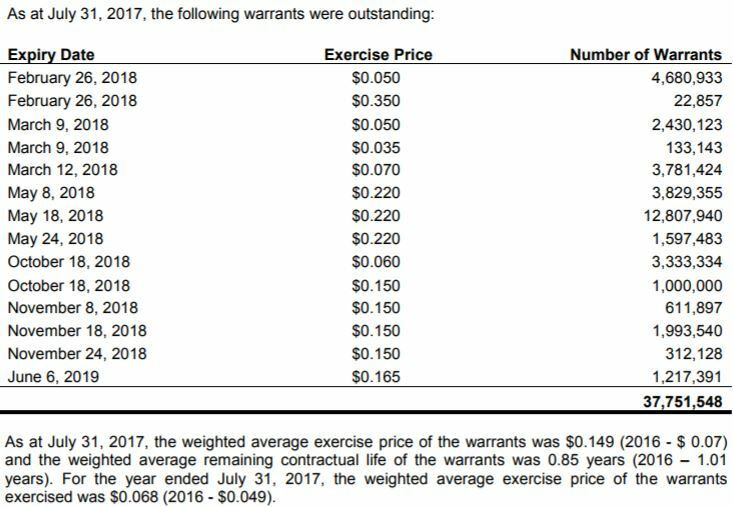 Nutritional High’s outstanding warrants as of July 31, 2017. As it stands currently, Nutritional High does not have the strongest share structure in the sector. It has been plagued by a higher level of dilution than most competitors, which resulted in a low price per share. This in turn only fueled further dilution as the company had to issue shares to obtain capital. Now, the saving grace for the company is that it may have a chance to turn things around for shareholders. As seen above, almost all of its warrants expire by the end of 2018. If the company can manage to not issue any more, it will slow the rate of dilution and provide further value to shareholders. As of the closing price yesterday all of these warrants are in the money, which means they will likely begin to be exercised should the current share price be sustained. 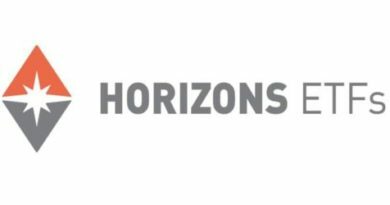 This will provide further funds to Nutritional High, and potentially eliminate any cash concerns the company presently has. This will in turn reduce the need for further dilution before substantial revenues are generated. 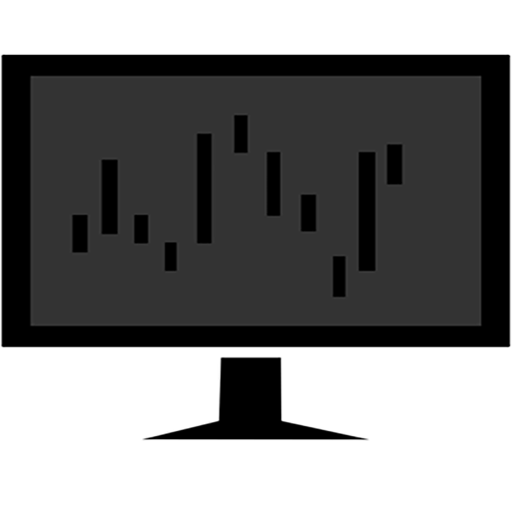 Undoubtedly, part of the excitement seen yesterday was a result of the market as a whole being up. Countless companies in the sector posted new fifty two week highs, including some of the market leaders. However, part of this is rush can also be attributed to the “Cali Rally” – the race investors are involved in to grab cheap stocks with exposure to the soon legal Californian market. For this, Nutritional High has firmly begun to establish its footing within the marketplace. It’s difficult to estimate what may happen in the coming weeks for stocks currently being pushed by this Cali Rally. 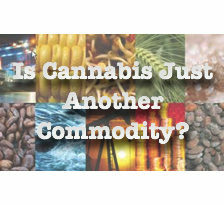 It could push stocks to new highs as new investors pile in, or it could become a “sell the news” event, whereby the hype is reduced now that cannabis has been legalized for recreational purposes. 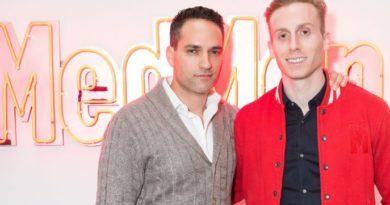 What is likely, however, is that it will provide investors a glimpse as to what can be expected upon recreational legalization in the Canadian marketplace. To that end, we can’t wait to see the result. Read the releases. Find the supporting data. Dive Deep. Information for this analysis was found via The CSE, SEDAR, California Cannabis Portal, Palo Verde and Nutritional High International. The author has no securities or affiliations related to this organization. Not a recommendation to buy or sell. Always do additional research and consult a professional before purchasing a security.